Many people think that viewing lovely homes is considered to be one of the perks of being a Property Consultant. As well as seeing how many people live, admiring the differing styles and the architecture of differing homes, we meet interesting people, see beautiful interiors and noticeably more recently beautiful smells have started to play a major role when viewing a property. This is due to nearly everyone having an array of flickering premium scented candles and reed diffusers. But do lit scented candles and diffusers really make a difference? I can assure you that there are many occasions that you wish a scented candle was lit as it would disguise the smelly pong of the dog, last night’s dinner or simply the lack of ventilation in some properties. Certainly it’s now a trend and has become the norm to have scented candles lit when prospective tenants or buyers are viewing your home. It used to be freshly brewed coffee, fresh flowers or the smell of freshly baked bread from the oven that was encouraged, but now the scented candle has become the ritual. Only too often there are rooms that are liberally scattered with candles and diffusers; at a recent viewing nearly every room, including the loos had lit candles on the go and, to be honest, the different smells became over-powering after a short while. The owners must have spent hundreds of pounds on scented candles and reed diffusers, and, if the property was being marketed for many months, just imagine the cost! There are literally hundreds of companies or candle-makers selling premium fragrance brands as well as the lower quality less expensive products. If you are struggling to think of a gift to buy someone, a scented candle or a reed diffuser makes an ideal birthday or Christmas present. Not everyone, however, sees the appeal of trying to create an ambiance; as someone pointed out recently, ‘it’s like burning bank notes’! Today the market is worth a staggering £90m and over 25% of all households buy and burn scented candles or have reed diffusers in their homes. 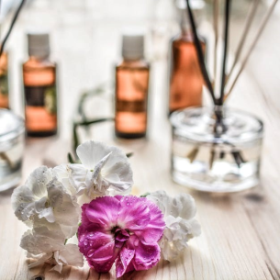 So, smelly scented vapours certainly make a difference and providing the ‘pong’ is not too over-powering then there is every chance that by having a scented candle or a fragrant reed it may help you rent or sell your home. However, let’s be honest, every successful transaction is dependent upon ‘price’ rather than how good your property smells!